Drumming to the rhythms of life. Abstract: Considers how drumming is becoming an important therapeutic tool in the United States. 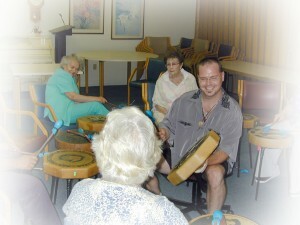 Drumming as a scared ritual in many societies; The benefits of drumming and other forms of music therapy in helping Alzheimer’s patients stay focused; The reduction of stress with drumming exercises; Speculation as to how music affects the brain in Alzheimer’s patients.